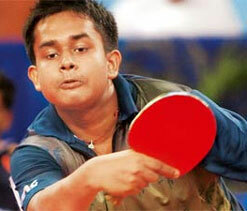 London: Indian challenge in Olympic Games table tennis came to an end as young paddler Soumyajit Ghosh crashed out after suffering a 1-4 thrashing at the hands of North Korea's Hyok Bong Kim in a second round men's singles encounter on Sunday. The 19-year-old player from Siligury lost 11-9 6-11 5-11 9-11 and 7-11 at the ExCel centre, a day after women's singles representative Ankita Das, the only other Indian competitor at the Games, bowed out in the first round yesterday. Soumyajit started off well, winning the first game, but lost the plot thereafter, losing four straight games in a row. It took the Korean just 25 minutes to see off the Indian who was making his maiden appearance at the mega event. Soumyajit had made a memorable debut at the Games by winning his first-round match against Brazilian Gustavo Tsuboi 4-2 yesterday. But unlike his opening match, Soumyajit was not his usual self and made quite a few errors, which proved crucial in the end. The match ended when Soumyajit netted a backhand following a long rally.